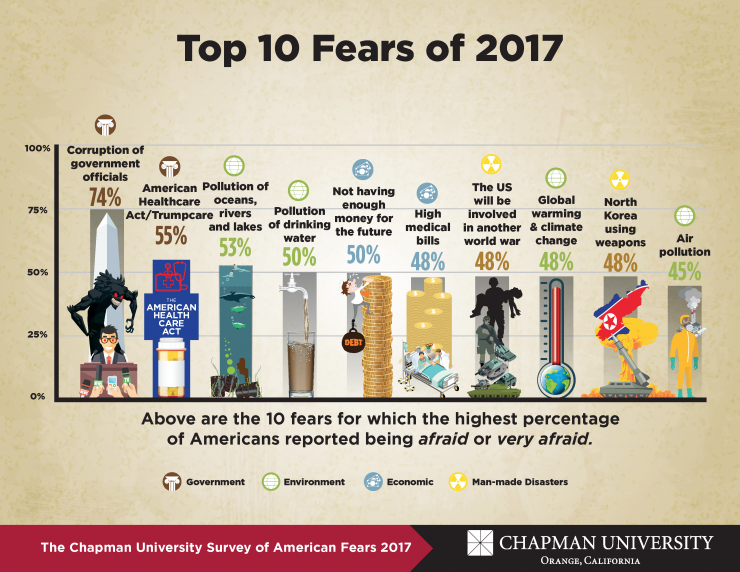 A year after the Chapman University Survey of American Fears identified undercurrents that rose to the surface in the 2016 presidential election, the 2017 Fear Survey revealed Americans are increasingly anxious and afraid. 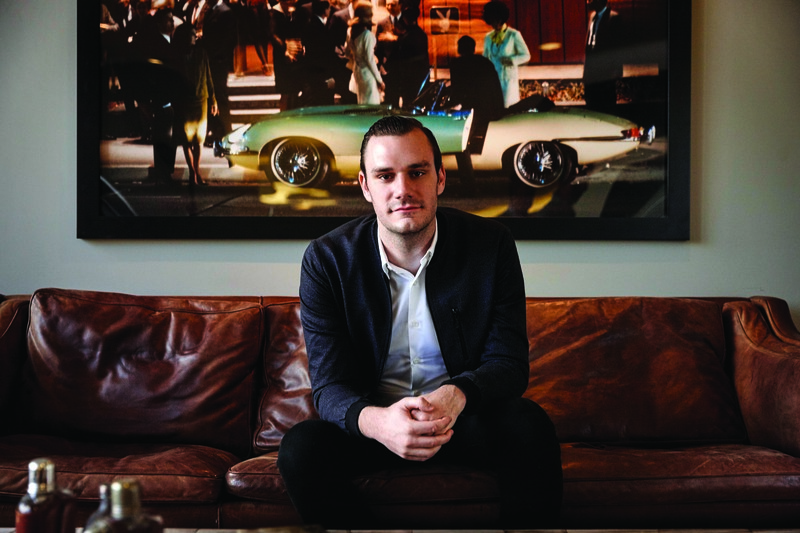 “In every wave of the survey before this, there was only one item where a majority of Americans said they were afraid or very afraid, and that was corruption of government officials,” said Ed Day, Ph.D., associate professor of sociology and one of three principal investigators for the survey. “On this year’s survey, there were five items where a majority of Americans said they were afraid,” Day said of the fourth annual report. Fear of government corruption increased dramatically, from 60.6 percent to 74.5 percent of adults in the random sample of 1,207 Americans from across the country. Most striking about results this year is that environmental fears figure more prominently than ever. Environmental issues never cracked the top-10 fears in previous surveys. Water pollution ranks third this time, followed closely by drinking water quality. There’s also a sharp rise in Americans who say they fear climate change (No. 8), which may be linked to President Trump’s decision to withdraw from the Paris Climate Accord. Another new fear emerged on the top-10 list. “Americans are afraid of a nuclear attack by North Korea,” said Ann Gordon, Ph.D., associate professor of political science and another of the principal investigators on the project, along with Christopher Bader, Ph.D., professor of sociology. This year’s Fear Survey also took a close look at extremist groups, with two threats front and center in the results: Islamic extremists and white supremacists. “One thing that stands out about Americans’ concerns is that as worries about national security go up, our commitment to national values (civil liberties) goes down,” Day said. For more on the survey results, visit chapman.edu/fearsurvey. 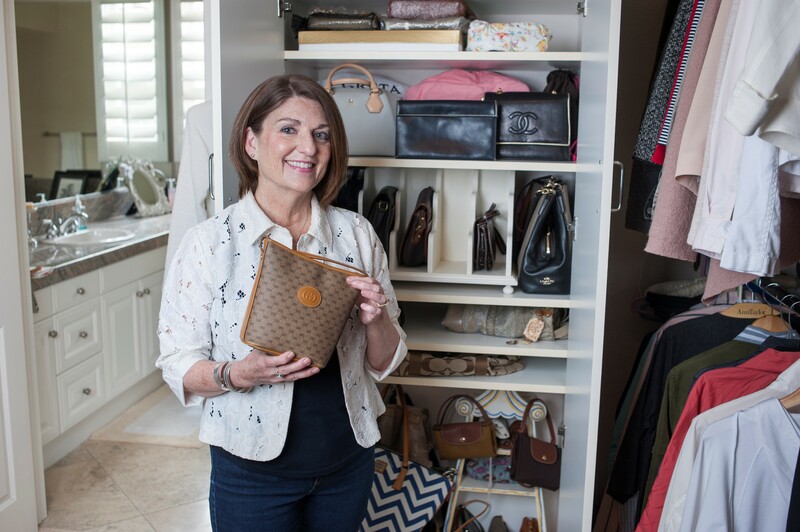 Lasting Lessons – As a teacher and philanthropist, Donna Ford Attallah ’61 sows seeds of generosity that continuously enrich the lives of Chapman students.